Automatically post to Facebook when you send an email, so you can coordinate your marketing efforts and save time. Share your campaign URL, or replace it with a link to your landing page, store, or anything else you want to promote to your followers. In this article, you'll learn how to set your email campaign to auto-post to Facebook. Make sure you’ve set up the Facebook integration. Facebook allows you to auto-post to a Facebook Page only, not your personal Facebook profile. Learn more about Facebook Pages and profiles. Facebook auto-post is available for regular, plain-text, or RSS email campaigns only. This feature pulls in your campaign subject line as additional text by default. Merge tags in subjects lines won’t display correctly on Facebook, so make sure to remove them from your auto-post. To learn how auto-posts interact with Social Cards, read Enable and Customize Social Cards. To auto-post to Facebook, follow these steps. Navigate to the Campaigns page of your account. Click the draft email campaign you want to work with. Navigate to the Add A Social Post To Your Campaign section of the Campaign Builder. Toggle the Facebook slider to a check mark. Click the Select page drop-down menu and check the box next to the Facebook Page you want to post to. In the field provided, edit the message you want to include with your post. This field pulls in your subject line and campaign |URL| merge tag by default, and can include up to 500 characters. Click Add Images to choose 1-4 images to display in your auto-post. If you want a Social Card to display with your auto-post, skip this step. Here are some guidelines for choosing your image. We recommend you choose a file smaller than 4MB. PNG files larger than 1MB may display as pixelated. Animated GIFs will display as static images. Nice job! When you send your email campaign, we’ll automatically post to your Facebook Page. 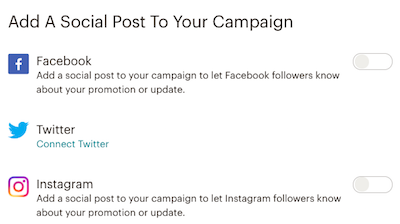 You can also set your email campaign to auto-post to Instagram or Twitter. Here are some resources to help you get started. Use Mailchimp's Social Cards to choose a featured image and text to appear when your campaign is shared on Twitter, Facebook, and Pinterest.